BodyTite is an excellent solution for individuals who are looking to reduce fat without the saggy, wrinkly skin. It also helps improve saggy skin after weight loss or due aging. BodyTite is a minimally invasive procedure that shapes, tightens and lifts without the scalpel or scar. You are left with surgical-like results without the added downtime. 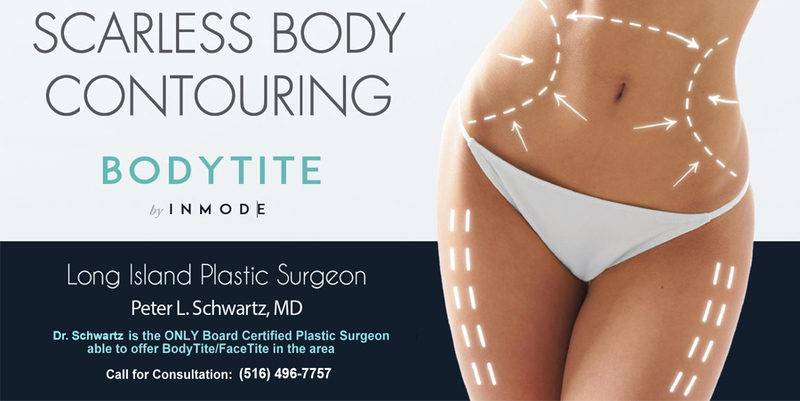 BodyTite uses RFAL (Radio-Frequency Assisted Lipoplasty) technology that addresses some of the shortcomings associated with traditional liposuction or surgical body lifts. If you can imagine it, you can do it: stomach, arms, chest, knees and inner/outer thighs are some of the most common treatments zones. Multiple areas can be treated in one visit. Each zone will take approximately 15 minutes of treatment. Results can be seen immediately, with the best results noticeable after 3-6months. FaceTite is a new procedure that is comparable to a surgical facelift, without the scars. FaceTite provides a dramatic improvement in skin laxity on the face and neck, which was previously only attainable through a surgical procedure such as a facelift. FaceTite utilizes minimally invasive radio-frequency energy to melt fat and tighten skin. FaceTite is a minimally-invasive procedure performed under local anesthesia or light sedation. Post-procedure, the patient can go home and resume regular activities shortly after. Wearing a compression garment is required for best results. Any area of the face and neck with saggy skin can be treated. This includes the double chin, jowl line and other areas with deep lines and loose skin. By avoiding an excisional facelift procedure, patients will be scar free and will benefit from reduces post-procedural swelling and discomfort. This is a less traumatic process with natural looking final results.